Arcade tennis with just heads and rackets! Can you beat all 10 seeds to win the Sports Heads trophy? Good luck Tennis Heads! The Sports Heads take America with Sports Heads: Basketball. Can you take your basketball head all the way to glory? All the fun of the Championship in brand new Sports Heads Basketball! Have you got what it takes to make the play offs? Sports Heads Tennis is back with tournaments, upgrades, two player mode, difficulty settings and more! Select one of your favorite players and see if you can conquer this volleyball court. Catch all the action as these two sports fans go head-to-head. Sports Heads take on MotorSports in this High Octane thriller. Can you be Number 1? 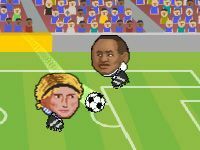 An update to our classic game Sports Heads Tennis - with updated players and graphics for you to enjoy. Can you beat all 30 levels of our addictive new Shot Training game ? Are you good at scoring goals with his head? Choose your favorite team and win the English football league making as many goals as possible or invite a friend to compete with. Find out if you can sink a few putts on this colorful mini golf course. It’s definitely a challenge that will keep you entertained in this fun golf game. With one of these rad cars, and a little luck, you’re sure to win every race on the planet. You can enjoy this mini golf game any hour of the day. Get as few strokes as possible while you complete each one of its eighteen holes. Grab a putter and see if you can play well on this mini golf course. Will you get a hole in one? These pint-sized cars and other vehicles are ready to race! You can compete against a friend or challenge the computer in this online 3D racing game. Send your car down several tracks that feature ramps and other hazards located in an awesome desert. Fight back against the nasty cavemen and other horrible creatures as you defend your kingdom in this brand new online defense game, Age of Defense Mini 2! Choose one of the rooms and kill all the zombies! Race your mini machines through the kitchen, office, and many more locations. Steer the mini cars away from obstacles and across the finish line!